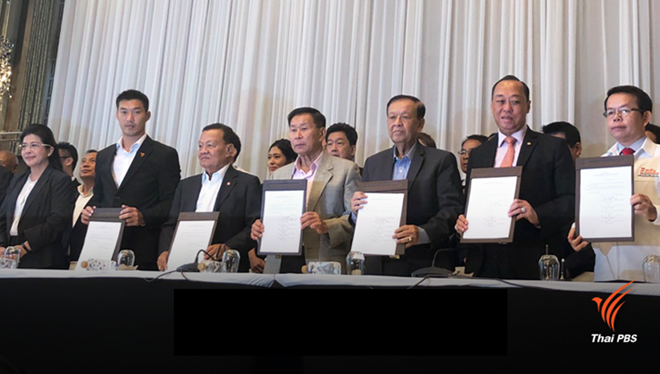 Bangkok (VNA) – The Pheu Thai Party, which backs former Prime Minister Thaksin Shinawatra, held a press conference in Bangkok on March 27 to announce the formation of a political alliance with six pro-democracy parties. The six participating parties include Pheu Chart, Future Forward, Seri Ruam Thai, Pracha Chart, New Economy and Thai People Power. Speaking at the press conference, the Pheu Thai Party's prime ministerial candidate Sudarat Keyuraphan said the alliance wants to set up a multi-party government on the basis of 255 seats secured in the 500-seat House of Representatives. She also called on other parties to join the alliance to lead the country. Future Forward Party leader Thanathorn Juangroongruangkit said his party supports Pheu Thai and Sudarat Keyuraphan is the most suitable person to become prime minister. According to unofficial results announced on March 25, among 350 seats in the House of Representatives directly elected at constituencies, Pheu Thai won 137 seats while the pro-military Palang Pracharat, which wants Prime Minister Prayuth Chan-ocha to remain in office, secured 97 seats.